Few spans of human life are so idealistic as our college years. There we meet many people from beyond our hometown, and we learn the treasures of diversity and different ways of doing things. Ideas mix and blend, and with professors who’ve learned so much telling us all the places we can go, the possibilities seem endless. I find the idealism of college kids refreshing. That’s one reason, I suppose, that I enjoyed teaching them so much. At work you’re far more often told why things won’t work and how they can’t be done. And I find myself thinking back to college and wondering when people lost their sense of vision. When did idealism die? Yesterday I spent on the campus of the University of Texas at Austin. 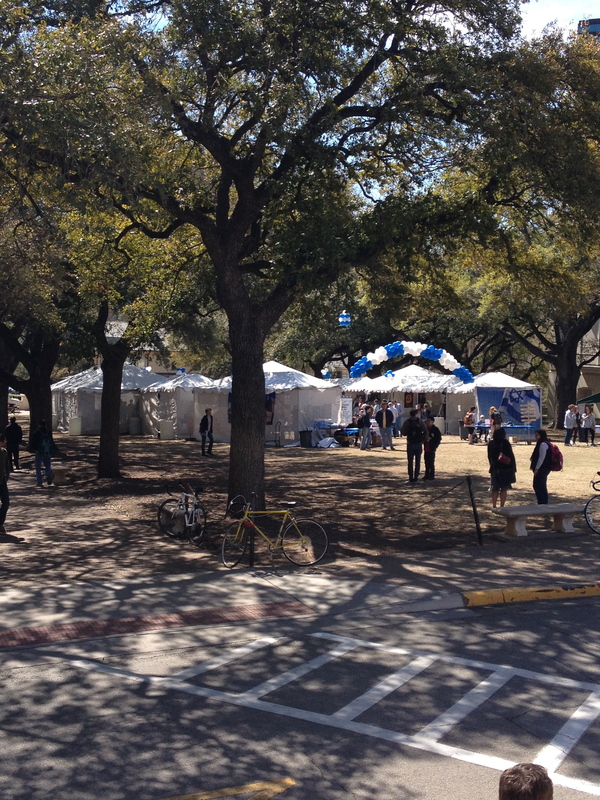 Between appointments I was crossing a quad area and noticed a bunch of blue and white balloons. We’re all still kids inside when we see balloons. I stopped to look. Then I noticed, across the street (in which sat a very obvious police car) a small group of students waving a Palestinian flag. Several police, frankly looking bored, stood between the two peaceful groups. Looking back to the balloons, there were a series of tents set up and a sign read “Israel Block Party.” Obviously this had been a carefully planned event, and we all know the heinous story of the constant persecution of the Jews throughout much of “civilized” history. 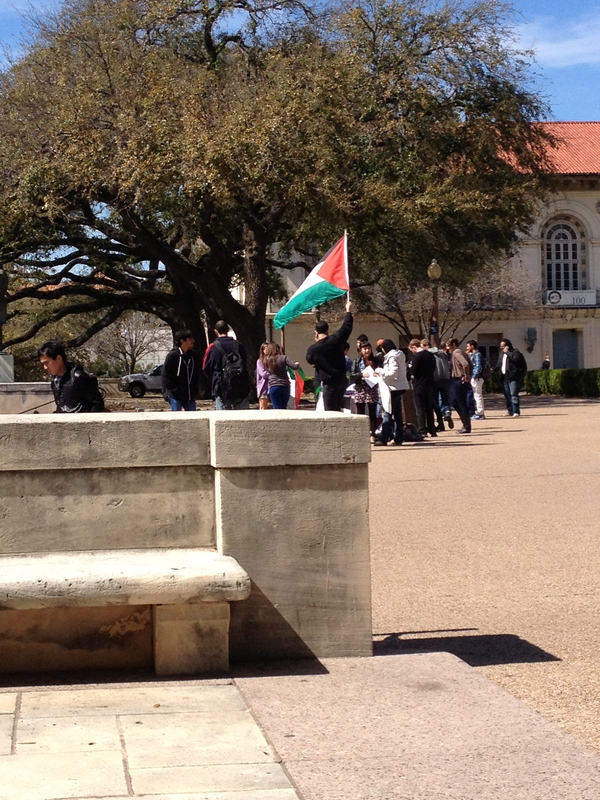 The simple table across the street bore the sign “Free Palestine.” Less than ten students stood around, handing out literature, peaceful, yet literally flying their flag. Yes, the Palestinians have also been oppressed for much of their history. If only adults could live so peacefully as these students. My heart went out to them. The issue of Israel and Palestine is one of the deepest scars in our collective human psyche. Indirectly, that conflict is responsible for many tragic terrorist acts, including the attacks of 9/11. And it is so frustrating because both sides (and there are actually more than two) are victims. We like our good guys in white and our bad guys in black. I’m still an idealist, after all. Yet in Israel/Palestine we have two historically oppressed groups vying for the very same land. And in the middle of this maelstrom, the Bible. The very book that can be read as an eternal promise by God that the people of Israel should own this land. By 1947, however, we’d stopped relying on God and began relying on guns. And atomic bombs. And life has never been the same since. Images of the wall going up between Israelis and Palestinians just after the wall went down in Berlin reminded me of Bush’s proposed wall between Texas and Mexico. Here in Texas just about everyone in the lower paying jobs I’ve met is hispanic. And friendly. Grateful in a way that many of us wouldn’t emulate in such low stations. We are all people. We all experience the same feelings, needs, and desires. Why not tear down the walls and let us look at one another? Take a good, long look. And my idealistic self says, if we face another human being with love everything will be all right. Maybe it’s just because Texas feels like the brass buckle of the Bible Belt, but I had moral qualms about landing in George Bush International Airport this afternoon. Texas has so many worthy heroes, but in the land of Rick Perry, recent Republican politics is king. Not queen. But king. It felt like a work of supererogation to drive to Austin after a three-and-a-half hour flight to Houston, but Texas reminded me of Illinois with palm trees. And cacti. Well, okay, and longhorns. One could get culture-lash flying here from New York. Before I embarked I had visions of my rental car being a huge Cadillac with real steer horns for a hood ornament. I just couldn’t picture myself in a ten-gallon hat. I sometimes wonder how religion could’ve come to divide a nation such as the United States. Founded on the principles of religious liberty, lately one party has been claiming the right to legislate morality for all, deeply polarizing a populace that should be able to accept differing viewpoints. Still, there are issues on which human rights insist there can be no compromise: women have equal rights with men, and have the right to self-determination just like men. It truly amazes me that such common sense can even become a divisive issue. If we could agree on even that, we’d have to declare it progress over the objections of the Religious Right. My thoughts wander that way when I tarry in the south. It’s really a pity. The people are friendly here and the landscape has its own beauty. Are we really that different? I’m not altogether convinced that this isn’t just a case of prejudice masking as religious sensibility. Religions can be all too gullible when they feel their honors might have been impugned. While I regularly express my opinion here, I do respect nearly every form of sincerely held religious belief. None of us has all the answers, and it seems the height of hypocrisy to insist that anyone is right all the time. Nevertheless, my sojourn beneath the Bible Belt has me wondering about the origins of various religious squabbles. Or maybe it was the just the long drive along the “presidential corridor” after touching down at an facility that most websites still refer to as simply, Houston International Airport. 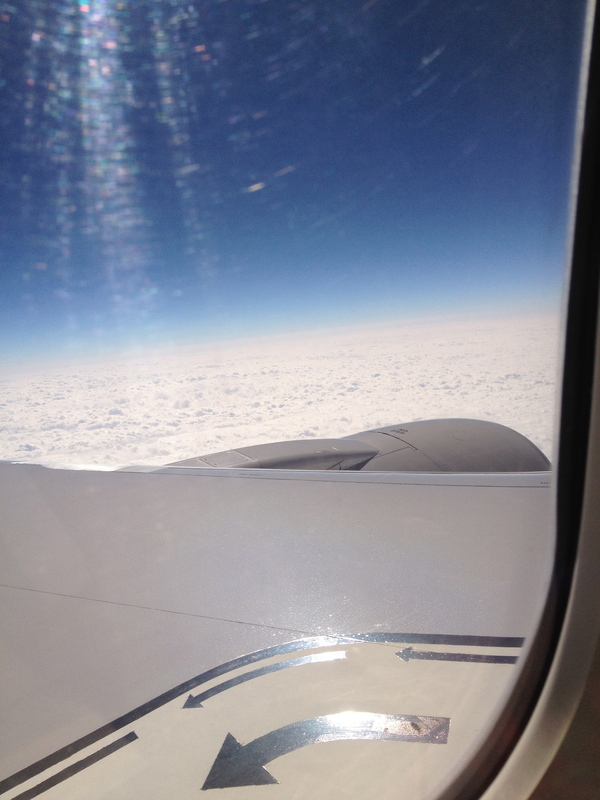 Travel broadens the mind—it is, in fact, an excellent form of education. Maybe if we got out more we would all get along better. From here we all look the same. So this is the way epiphany works. (I know it’s Lent, but I’ve got bigger fish to fry.) I sat down to check my personal email after a horrid day at work, and since I have a Verizon account, I can’t help but see the news headline that’s on the page when I open it. When the headline said something about a new continent discovered by scientists under the ocean, I’ll have to admit that Atlantis sounded better than anything I’d heard in the office. So it was worth a click. Turns out that this isn’t Atlantis at all—I have this habit of making naive assumptions—but a continent just north of Madagascar that sunk some nine million years ago. No happy lemurs or Homo sapiens around then. So when this Atlantis sank, there was nobody around to see it. At least not Plato. The story was broadcast by Newsy and it made mention of Science World Report. Here’s where the epiphany piphed. I’d never heard of Science World Report. When I went to their site, the wonders of the universe spread out before me. “Dying Stars Reveal the Clue to Extraterrestrial Life: Earth-like Planets Unmasked” read one headline. “How Dinosaurs Evolved the World’s Longest Necks While Giraffes Fell Short.” These are the things I need to brighten me after a rotten day. A world with wonder in it. A world where money is not the sole, or even the highest good. A world where an intellect need not go to waste. “Human Language May Have Evolved from Birdsong: New Meaning for Communication.” This website is like my eternal monologue in headline format. I’m not naive enough to suppose this website will be the nepenthe for all my workaday woes. But it does serve to remind me that science and religion are not always foes. A religion only becomes belligerent when it takes its truisms too seriously. We evolved in a world of wonder, but we’ve taken great care to remove the wonder from it. As if joy and delight were puerile phantasms with no place in the serious adult world of finance and industry. I became an educator because I’ve always been in love with ideas. I lost my job in education because I was an idealist. Yes, continents do indeed sink. And while it may not be Atlantis down there, a simple click led me to a world of wonder. And that is, if anything can be, cause for hope. 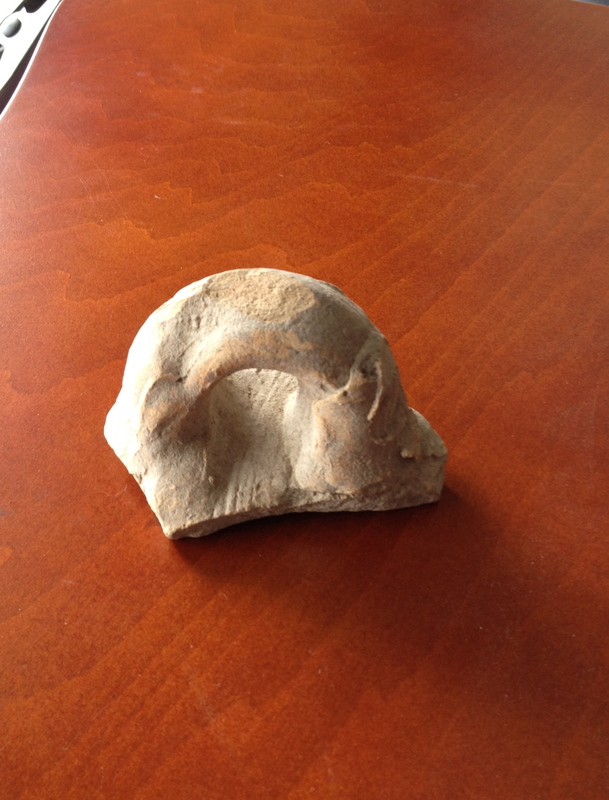 A friend recently sent me a package with a Roman jar handle from Caesarea Maritima. It’s not everyday that I receive 2000 year-old artifacts in the mail. Holding that ancient jar handle reminded me of my short stint as a wannabe archaeologist, not far from Caesarea at the site of Tel Dor. There’s no thrill like unearthing an artifact that has been buried for millennia, knowing that you are touching something a fellow human being dropped for the last time back in the days of the early Roman Empire. It is a humbling experience. In all probability the final touch was a heave into the dump, since clay jars are easily broken. But as I finger this ancient piece of useless junk, I can plainly make out how fingers like mine twisted the clay and pressed it on the jar body, much as I once did in art class, decades ago. I am connected with a stranger over the millennia by this simple bit of clay. We are united in an ancient family. Archaeology began as a biblical venture. Anyone who watches Raiders of the Lost Ark with archaeological sensibilities, after rolling their eyes (yes, it’s deserved) can’t help but realize a kernel of truth is buried here. Archaeologists don’t search for the ark, but it was religion that gave them the idea in the first place. Travel to the Middle East and begin digging up the places mentioned in the Bible. Those early archaeologists wanted to prove that the Bible story happened just as it was laid out. Only it didn’t. Archaeology soon began to reveal a more complicated picture. Jericho was uninhabited in Joshua’s day. And was there even a historical Joshua? What began as a charge to demonstrate that the Book of Books never gets it wrong transformed into a science with its immutable commitment to objectivity. And objects. The desire for historical proof meets a deep need in people. We want to know what really happened. This simple jar handle before me tells a mute story of a person like most of us—never famous, never noticed in the noise of first century Palestine. Just some Jane or Joe throwing out the trash. That is the story of archaeology. That is the story of human life. Every once in a while I ponder how insignificant we are. The vast majority of us will be remembered only a few years or decades beyond our demise. What will our artifacts say about us? One of the relics that will be found in the rubble of my life will be a Roman jar handle from an even earlier age. Long ago deemed junk by a person so different, but not so very different, from me. It was discarded two millennia ago. When it was found in the twentieth century it was a treasure. Thanks, Susan, for putting me in touch with history. H. P. Lovecraft was a tortured man. An atheist, he saw the inevitable dilemma of human life. We want to live forever, but even the short time we have is full of suffering. Almost Buddhist in his sensibilities, Lovecraft also knew the hubris of trying to reach too far. I was reminded of that when I recently watched Stuart Gordon’s Re-Animator. Like most of Lovecraft’s stories, the translation to film is difficult. The angst and haunting lie far too deeply embedded in the original stories to show, even with the finest acting, with any degree of verisimilitude. And the tales have to be padded out to get to that magic 85-minute mark. Nevertheless, there is something of their master still in them. 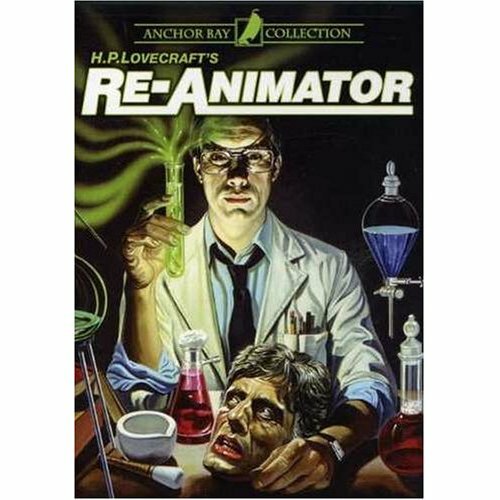 Re-Animator is based on Lovecraft’s short story, “Herbert West—Reanimator.” West discovers the secret to bringing the dead back to life. In the movie version, the result is unremitting chaos. The dead are somewhat zombie-like until Dr. Carl Hill, very freshly dead, retains his consciousness and begins his insidious plan to create a cohort of more proper zombies to do his will. Like Gordon’s other interpretation of Lovecraft, the eerily moody Dagon, there is a little too much blood-lust for my liking, but a point is being made, so I watch on. The point is very much at the heart of Lovecraft’s personal dilemma. We want to live forever, despite the pain and disappointments of the life we know. Life is optimistically resilient that way. Lovecraft died a painful, natural death at the age of 46. His writings never demanded much attention during his life—thus seems to be the fate of many of the truly original. In the 76 years since his death he’s gained an enviable following. He might almost be said to have achieved a kind of immortality. A safe immortality. As he knew in life, resurrection is a double-edged sword. We may be reluctant to give up the only life that we (most of us, anyway) have consciously known, but have we really considered the implications of going beyond the line that nature has drawn for every living thing ever animated? Our technology keeps us alive in bodies that only continue their inexorable march toward the grave. Am I sounding a bit bleak? Blame it on the rain. Immortality, in any belief system, only comes at a great cost. H. P. Lovecraft knew that and took the risk in spite of it. All religions deal with death in some detail. Perhaps that’s because death is such a universal experience. I think about it quite a lot—not to do so seems to be caught at a crisis without having thought through the implications—but mine are not always morbid thoughts (although, by definition, they may be). When I read Mary Roach’s Stiff a few years back, before I started this blog, I was amazed by the number of ways one could decide to have their “remains” treated. When I was a kid it seemed that there were only two options: bury them or burn them. To some religions the latter option felt a little close to Hell and was condemned as a sin. Occasionally I’ve posted here about various new methods that have made the news: having yourself morphed into a bullet or diamond. In what I hope was not too much of a hint, my wife shared a further option with me—having yourself turned into a tree. Now while this seems what nature intended, it also feels profoundly Asherah-like. I have my doubts that Asherah was a generalized tree-goddess, but there is some kind of connection between wood and the goddess. Certainly by the Rabbinic Period of Judaism any tree in or near a sanctuary could be understood as the goddess and therefore a threat to monotheism’s hegemony. The solution: chop down the tree. Now Asherah whispers back, when you die, I can make you a tree. People, like all animals, biodegrade when they die. Some saints apparently avoid this fate while others are pickled to a state of perfection artificially, but for us regular folk nature has a plan. Animals eat the plants, plants eat the animals. We are all consumers. Bios Urn is the brainchild of Gerald Moline and features your deceased body packaged in a biodegradable urn along with tree seeds of your choice. All you need is a post-holer and a bit of rain. Some might wish to be a redwood with their aspirations to immortality. I think I would prefer to be an apple tree. Apple trees give back year after year. Plants, by their floral nature, are givers. The apple tree gives in a way that seems especially divine. After all, many are those who claim it is the very tree of Eden. Not only gods are proficient at creating worlds. Writers, as readers know, are the creators of worlds too. I first discovered Jasper Fforde via a friend’s recommendation. With the depressing demise of bookstores, however, I end up picking up whichever one happens to be on the shelf. Not that this is a bad thing, but I find myself in a melancholy cast when I think of all the joy that is not being had by avoiding reading. It’s all rather hollow, wouldn’t you agree, Mr. Eliot? 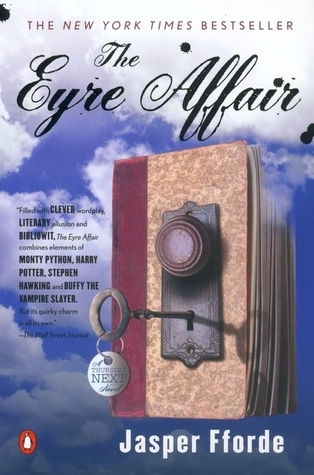 All of which is to say Jasper Fforde’s The Eyre Affair was great fun. As usual when I read fiction, I kept an eye out for how religion appeared in this alternate world—most fiction that ignores religion completely somehow seems to be less realistic than Fforde’s fantastic tale. In the world of Thursday Next, the churches are dedicated to GSD, the Global Standard Deity. As one of the characters explains, the GSD is a combination of all religions intended to stop religious wars. It’s a great idea on paper, but religions are prone to wars as sparks fly upward. Somewhat later in the novel Thursday encounters a crucifix-wearing vampire. Fooled by the sigil, she almost becomes a victim to the blood-sucker. When Thursday points out the supposed impossibility of a vampire wearing a crucifix, he replies, “Do you really suppose Christianity has a monopoly on people like me?” Although Fforde can be a great comic writer, some of his quips are quite profound. Indeed—does Christianity have the only vampires? All religions have their monsters, whether that’s what the author meant (score one for reader-response theory). The truth is the truth, no matter whether intentional or not. The idealized world of The Eyre Affair is one in which religion has become universal. The great military conglomerate in the book is called Goliath not because of the Bible but because of its size and apparent strength. It is brought to its knees, however, by Thursday—a female David, if you will. In practical terms, throughout the book the military is much more powerful that the church of GSD. Perhaps that’s because people are afraid. Religion, which once upon a time allayed fears, has now become one of their main generators. “Nothing frightens me more than religion at my door,” John Cale once sang. In this rich complexity the reader is invited to bask as Jasper Fforde works his magic. Do yourself a favor and pick up one of his books. Before it is too late. You might find yourself learning a thing or two about religion. I did.